Picture this scenario: It’s saturday morning and you flip on the morning news. Today’s forecast, sunny and mild with a high of 75 degrees. You finish up breakfast, put on your riding gear and head out to the garage to hop on your motorcycle and carve the canyons. You insert the key, turn it to on, pull in the clutch, push the electric start and then you hear it….. the dreaded click-click-click. You have a dead battery. The frustrating part is that this can be avoided with some basic maintenance on your battery. Motorcycle batteries are much smaller than car batteries in order to minimize their weight. While you are riding your motorcycle, the battery is being charged by the bikes charging system. The problem comes when you let your bike sit for a while. Due to their natural drain, motorcycle batteries can lose up to 1% of their life per day when not used/recharged. The easy way to eliminate this problem is with a battery charger such as the “Battery Tender”. The Battery tender has two cables, one that plugs into an electrical socket and the other that attaches to the terminals of your battery. When plugged in, the Battery tender will apply a small current to your battery based upon how much charge it has remaining. Once it becaomes fully charged, the tender switches modes and dleivers less current to maintan the battery at full charge. This one accessory can allow your battery to last for up to five or more years. The Battery Tender can be purchase at Contra Costa Powersports or any other store that carries powersports accessories. 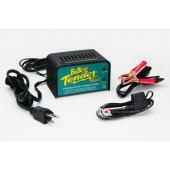 There are several different models of the Battery Tender available starting at $39.95. This entry was posted in Parts & Accessories on January 29, 2012 by Dave. Thanks for telling me how to increase the life of my motorcycle battery.